With the rise of awareness in school tragedies in recent years, school administrators are increasingly called upon to address parents’ growing concerns for their children’s safety but often lack the funding to make many of the kinds of changes needed. For these schools and even those that have the funds to make their schools safer, it’s all too easy for school administrators to unknowingly put measures into place that actually put their staff and students in greater danger. Some of the devices intended to secure the entry doors leading into the school and classroom doors – the only remaining barrier between an intruder and his intended victims once inside the building – may not meet fire and life safety regulations. It can be difficult to know which ones do meet guidelines and which ones don’t, because there is no requirement on the part of manufacturers or distributors to disclose this. Locking hardware that doesn’t require a key – the unrestricted ability to lock or unlock a door can allow anyone to take control of the opening. Top jamb lockdown wrap– These are small, lightweight cylinders that slip over the large hydraulic hinge located at the top of the door. They effectively lock the door by keeping the hinge from expanding. Other similar devices are available that clasp around the arms of the v-shaped hinge to prevent the door from opening. Floor bolt locks – These devices are similar to the deadbolt locks commonly in use on homes but are installed on the bottom of the door into the floor. The problem with this type of device is that the lock must be manually set, which can be difficult to remember in the event of an emergency. And, it locks both ways, preventing egress and allowing intruders to barricade themselves inside the room, potentially taking hostages in the process. When you consider the number of doors that even a small school would need to secure, the appeal of these devices is understandable. Most of them sell for a fraction of what it would cost to replace existing door locks with mechanisms that lock from the inside (classroom security locks), and for administrators struggling to find the funding needed to address parents’ demands for better security, they can seem to be the perfect solution. Some of these devices are simply not effective security measures, while some actually increase risk by violating fire and life safety codes. With so many devices now on the market, it’s more important than ever for school administrators to understand the code requirements that pertain to doors in order to avoid spending precious funds on such devices, only to find out at their next annual fire inspection that they have to be removed. All doors, whether exterior or classroom doors, are highly regulated because they are classified by building and fire codes as part of a building’s means of egress. Relevant regulations include but are not limited to the International Building Code (IBC) and the National Fire Protection Association Life Safety Code (LSC) – the two codes from which most local building and fire codes are derived. These regulations generally define “means of egress” as “a continuous and unobstructed way of travel from any point in a building or structure to a public way”. For schools, this refers to the unobstructed route from inside every classroom or interior space to the outside of the building. Any door along this route is classified as an egress door. Removable physical temporary barriers, like a school desk placed in front of a door or a removable "door jammer", do not obstruct normal egress and are only implemented in the rare occasion of an emergency. These type of physical temporary barriers would not fall under building requirements since they are not part of the building. Doors must be arranged to open readily from the egress side, which is the side within the interior of the building or classroom, whenever the building is occupied (LSC). Keyed devices can be used provided that the key cannot be removed when the door is locked from the egress side (LSC). Egress doors must be able to be opened from the egress side without the use of a key or special knowledge or effort – things that might be difficult to find, remember, or do in the event of an emergency (IBC). Similarly, no locks that require the use of a key, a tool, or special knowledge or effort for operation from the egress side may be used (LSC). Doors in spaces large enough to hold more than 50 people (usually 1000 square feet), must be equipped with panic bars. This applies not only to large spaces within a school but also to the school itself, meaning that all exterior doors should be equipped with panic bars on the inside (LSC). When it comes to securing the doors in your school, finding a balance between security and fire safety starts with understanding of the safety and security-related functions of school doors, which can vary depending on the hazard. When it comes to exterior doors, the requirement for unrestricted egress is problematic for schools because it makes it easy for students to let others inside the building. However, as concerning as this is, it is absolutely critical to fire safety to ensure all means of egress from the building remain open at all times. In the event of a fire, interior doors help to control the spread of smoke and flames and provide egress for students to get out of harm’s way. In the event of a school shooting, interior doors can also act as a shield, protecting those inside the classroom or other areas within the school from violence occurring on the other side of the door. Classroom function locksets – the kind with the key cylinder located on the outside of the door – have long been the standard method used for locking classroom doors. With this type of hardware, no one can enter the classroom when the door is locked, but those inside the classroom can exit freely. However, recent school shootings in which the perpetrator was able to get inside the building have raised new concerns about how much security these locks really provide. With the key lock on the outside of the door, during a lockdown, teachers must step out into the hallway to lock the door before getting back inside the classroom, exposing themselves to danger if an intruder is inside the building. And, if the door is left locked at all times, students in unsupervised classrooms can lock others, including the teacher, out by simply closing the door. While these types of locks are still allowed under current regulation, many schools are opting for newer classroom security function locksets that include a key cylinder on the classroom side of the door. This allows the door to be locked without leaving the room. A common standard practice in many schools is the keep the doors locked at all times and only unlock them during class changes. Manual lockdown hardware, which relies on the use of keys to manually lock the door. Classroom security function locksets are an example of this type of hardware. Remote lockdown hardware, which are electronically-controlled, wireless and keyless door locks that can be activated by a remote fob within proximity of the door. Centralized lockdown hardware integrated with access control software allow for doors anywhere in the building to be locked from one location. Many of these systems include visual indicators on the locks, which allows teachers inside the classroom to verify at a glance whether the door is locked. These solutions can cost as little as $200-$300 per door up to thousands of dollars for centralized access control. But, if your school does not have the budget for any of these options, there are still a number of low-cost measures you can take to enhance your school’s security without compromising fire safety. Install face plates, which are relatively inexpensive and readily available at hardware stores, to prevent jimmying of locks on exterior doors. Conduct monthly inspections of all exterior doors – frames, overhead lights, hinges, locks, and latches – for damage and make any needed repairs immediately. Keep interior doors closed and locked while rooms are in use to allow for a faster lockdown in an emergency situation. Develop a safety plan for your school that includes protocols for staff and identifies places to hide, and provide training so that staff are prepared to implement it on a moment’s notice. At Koorsen, we have seen far too many well-intended and, in some cases, innovative solutions that do not produce the security they promised for school administrators trying to protect their staff and children in their care. Many in fact, actually increase safety risks. Before investing in any aftermarket security devices for your doors, we recommend contacting the local authorities, in particular the fire marshal and building inspectors, to verify that the devices you’re considering will not violate fire and life safety codes. Or, you can call Koorsen. Koorsen Fire and Security is a comprehensive provider with deep expertise in school security. 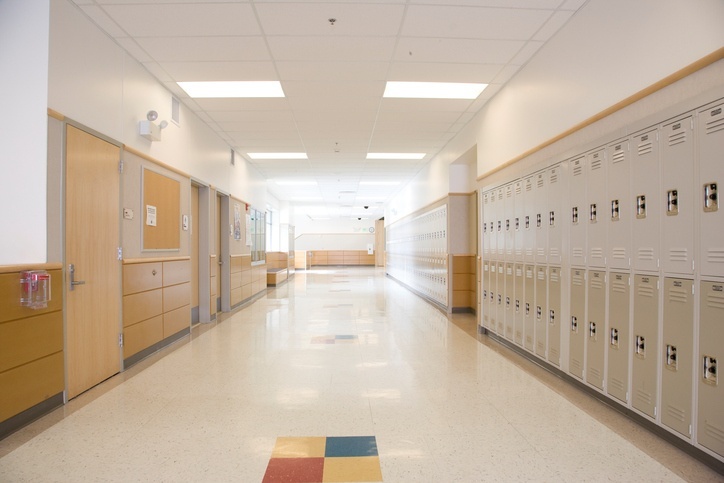 Our experts know all the regulations pertaining to school doors and how they work together. In addition to staying in the know on potential sources of funding available for school security, we offer comprehensive security audits that examine all aspects of your school’s security, from your emergency communications systems to the locks on your doors, and can help you select the devices that will meet your needs and budget.